Hussein Rashid, who attended this year's Fes Festival of World Sacred Music, has uploaded photos at http://www.flickr.com/photos/islamoyankee/ and videos at http://www.youtube.com/user/islamoyankee. He wrote: "YouTube does not yet make it easy to embed a Creative Commons license, but I am releasing the videos under the same license as the photos found on the Flickr page. I am an amateur, who got a new camera just before the trip, so please forgive some of the quality. I am still going through my material and will continue to upload as I go through it. I will also, hopefully, edit some of the video over the course of the summer." 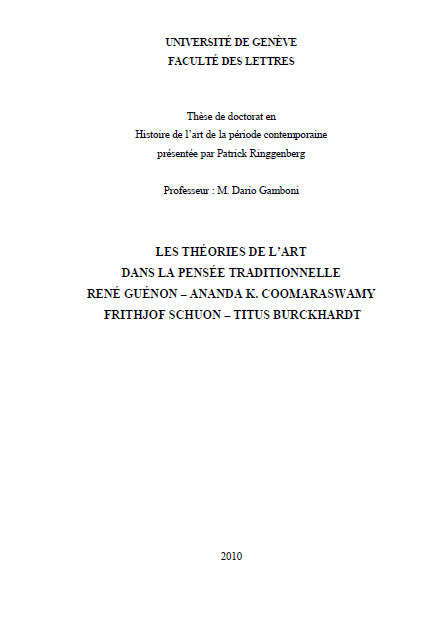 An important new dissertation has just been defended at the University of Geneva: Patrick Ringgenberg, “Les théories de l'art dans la pensée traditionnelle. René Guénon - Ananda K. Coomaraswamy - Frithjof Schuon - Titus Burckhardt.” It is to be hoped that this dissertation, which is a major contribution to the study of Traditionalism in recent years, will soon be published as a book. The dissertation deals, as its title promises, with the theories on art of the three major figures in the Traditionalist movement, as well as with those of Titus Burckhardt–important for theories on art, if not so much for Traditionalism as a whole–and of Luc Benoist, also important for theories on art, whose views are dealt with more briefly (and so not mentioned in the dissertation’s title). The dissertation is an impressively detailed and comprehensive study of Traditionalist views on art. Guénon himself was not much interested in art as such, but he was interested in the initiatic function of the métier, and in symbolism, and these interests formed the basis of the Traditionalist theories of art developed by Benoist, Coomaraswamy, and others. Art was important to Coomaraswamy and Benoist because it was their professions–both were art historians. It is with Schuon that art became really important to Traditionalism as a whole. This was partly because Schuon came from an artistic milieu and had an artistic "temperament," and partly because one major difference between him and Guénon, as Ringgenberg convincingly argues, was that he was interested in areas that Guénon had ignored– the “human content of spiritual phenomena,” areas of life such as emotion and love, and the living phenomenology of religion. This was one reason he was able to transform Traditionalism from a theory into a reality in the form of the Maryamiyya. And it was also one reason why art became so important. Art was, in Schuon’s view, important for creating a milieu in which other things became possible. Spiritual influences, he wrote, "need a formal ambience which corresponds to them analogically, without which they do not spread, even if they still remain present." For Schuon, following Plato, earthly beauty was a (poor) reflection of a non-earthly reality, and thus a divine emanation. It was central to his spirituality, and so to that of the Maryamiyya. Ringgenberg does not go so far as to suggest that the Maryamiyya was, in a sense, a work of art, but the argument might be made. Ringgenberg convincingly argues that Schuon's own painting owes rather more to Gauguin than to Traditionalist theory. The problem was that, though claiming to despise and ignore the modern, Schuon’s painting could not overcome the modern, and was itself therefore modern, without acknowledging this and without, as a result, being able to address it. This may be a problem for Traditionalism as a whole. As Ringgenberg writes, “these authors forget that universalism cannot be expressed as such, that it is always individualized by its expression, and that it is an abstract ideal filtered by human consciousness and by a cultural and historical moment." Lui qui insistait sur l’impersonnalité des artisans, des sages et des philosophes « traditionnels », qui se refusait à toute donnée autobiographique au nom d’une vérité qui dépasse les individus ; lui qui entendait faire parler les textes pour dissimuler sa subjectivité et déployer des trésors d’érudition pour cacher sa démarche herméneutique, qui défendait un universalisme pour échapper à tout particularisme religieux et toute subjectivité confessionnelle, il n’a pas eu conscience que cette volonté d’effacement et cette aspiration au « supra-individuel » révélait, en creux, comme chez Guénon, une personnalité qui a élaboré son image de l’universalisme et dressé son propre miroir (p. 370). With regard to sources for other researchers, Ringgenberg draws attention to the usefulness of Schuon’s poems as autobiographical sources, especially for the period not covered by Erinnerungen und Betrachtungen. He also recommends two books above all for Traditionalist theories of art: Luc Benoist, Art du monde. La spiritualité du métier (Paris: Gallimard, 1941) and Titus Burckhardt, Principes et méthodes de l’art sacré (1958; Paris, Dervy-Livres, 1976). "Regards sur l’islam et la société"
Plus que jamais, l’islam est l’objet d’une interpellation et d’une interprétation globalisée. Entre ceux qui le considèrent à travers le prisme réducteur des signes extérieurs de religiosité (minarets, mosquées, voile et burqa), et ceux qui tentent de le renouveler sur la base d’une réforme radicale ou d’un ressourcement spirituel, il y a un khulf, un différend qui n’est pas prêt d’être dépassé. En tout cas si les tenants des thèses éradicatrices et orientalisantes s’attachent à bricoler un islam à la taille et à la mesure de l’Occident, ceux qui prônent le renouveau et le ressourcement spirituel réactivent les méthodes de l’ijtihâd (lecture critique) qui autorise l’imbrication dans un même geste éthique et liberté, croyance et citoyenneté. Cette rencontre est l’occasion d’engager un échange entre deux penseurs musulmans qui oeuvrent activement, chacun à sa manière, pour l’avènement d’un islam du vivre ensemble, en phase avec sa société et son époque. Omar commented: "Just wanted to remind you that Erdogans chief advisor is Ibrahim Kalin who is also a disciple of Seyyed Hossein Nasr. That means traditionalism is now at the core of a modern political movement, the AK Party." Dr Ibrahim Kalin is Chief Foreign Policy Adviser to Prime Minister Recep Tayyip Erdoğan, and so certainly close to the AK leadership. Dr Kalin of Turkish origin and is an assistant professor at the Walsh School of Foreign Service at Georgetown University in Washington, DC, where he works on post-Avicennan Islamic philosophy, notably Mullah Sadra; he has just published a book on Mullah Sadra's concept of "transcendent wisdom," Knowledge in Later Islamic Philosophy: Mulla Sadra on Existence, Intellect and Intuition (New York: Oxford University Press, 2010). Dr Kalin is also active in the Common Word initiative, which has been pursuing real dialog with Western churches since 2006. I have often been told of interest in Traditionalism among the AK leadership, which would not be a great surprise, given the popularity in Turkey of the work of Dr Nasr. Dr Kalin seems very much to follow the model of Dr Nasr. Both men are of Muslim origin, both teach in DC and are authorities on "traditional" Islamic mystical philosophy, and both are active in the Common Word initiative. My thanks to Omar for this information. The 2011 issue of Studia Phaenomenologica is dedicated to the topic: Concepts of Tradition in Phenomenology. As it is commonly known, Husserl’s phenomenology demanded at its first breakthrough a total refutation of all uncertified knowledge, theory or meaning inherited from the past. However, the development of phenomenological inquiry gradually resulted in a more ambiguous attitude towards history and tradition. On the one hand, history and tradition are necessary but still unfortunate distortions, which hinder phenomenological research in its strive for original self-givenness; on the other hand, they become themselves universal phenomena that must be explored as such. As recent publications of late Husserlian manuscripts have revealed, Husserl himself became more and more aware of these topics in his last decade, as he was finally inclined to interpret the Life-world itself in its full concreteness as a “generative tradition”. Tradition in this sense pertains to all meaning sprung from earlier acquisition. Therefore, the concept obviously exceeds its ordinary meaning, exclusively related to inter-subjective historical inheritance, by gaining a fundamental importance for all areas of phenomenological analysis, as they all have the characteristic of “traditionalizing”. Thus, there is “tradition” at work in all action or bodily movement, in every instance of a given situation and in any relation to another thing or being. Understood in this broad sense, the term does not address only the genetic fact of sedimentation, but also a specific, “habitual” quality that things allow to see through themselves, as bearers of a past. Hence, the theme marks an intersection of various problematic strata in Husserlian phenomenology, starting from the correlation of genetic and static phenomenology, following through different aspects of phenomenological methodology, and up to several ground-themes of phenomenological research, such as historicity, memory, language, bodily existence, inter-subjectivity, life-world and others. The same twofold relation to tradition – of growing thematic interest, on the one hand, and utter criticism, on the other – shows in the post-Husserlian phenomenology as well. Heidegger, for instance, is from his early beginnings convinced that history should be the true guideline for phenomenological research, while at the same time pleading for a systematic destruction of the philosophical tradition. A similarly ambiguous position defines his later project of transcending metaphysics, and certainly other examples can be found as well. The aim of our 2011 issue is therefore to explore the two fundamental poles that define the phenomenological approach of tradition: the task of understanding the problem of tradition thematically, on one hand, and the necessity of confronting it methodically as a residual distortion, on the other hand. For further information, see the full Call for Papers at http://studia-phaenomenologica.com/?page=advertise.